It will not have escaped many people that this weekend is Super Bowl Sunday. I know it is about the culmination of many months of blood, sweat and tears – and that’s just the fans – but there is also a whole lot of eating going on. According to this article, Super Bowl Sunday is the second biggest day of food consumption in the US. This annual fixture is beaten only by the holiday for which Lycra was created – Thanksgiving. I have trawled open-mouthed at pages of Pinterest boards and compilation webpages of the most amazing and, also atrocious, creations that will fuel the nation on Sunday. Many involve chicken body parts, or cakes/cheeseballs/hardboiled eggs in the shape of footballs. There is even a whole category of food gloriously promoted as ‘trash food’, usually involving the clashing of various boxed ingredients with assorted confectionery or Fritos/Cheetos (delete as appropriate). Oddly enough this seems okay. This seems to be the day that anything goes, with perhaps the exception of fancy food. No one will be doing a sit down meal. It is all about the buffet feast. A time when neighbours, relatives, employees/employers, friends and even some enemies graze a creatively calorific spread, all while watching grown men carry, kick and fumble an oval-shaped bowl for pride, and not a little money. 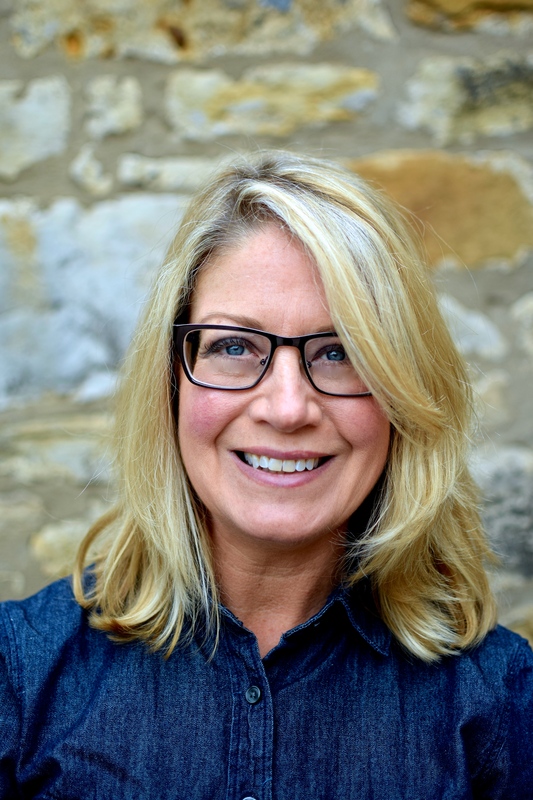 I think these days – fuelled by websites, TV food shows, blogs, Tumblr and Pinterest – the food action is nearly as important as the field action. But then I am biased I suppose. Warning: History Ahead – For anyone not raised or living in the US it will be difficult to comprehend how important the Super Bowl is. It certainly didn’t debut as a fully-formed televisual spectacle when it was first played in 1967, under the clunkier moniker of AFL-NFL World Championship Game (I love how even things only nationals can play are termed ‘world’). The half-filled Los Angeles stadium may have been thrilled, but the rest of the US yawned. But the frankly genius 1973 advertorial pairing of football’s biggest star Joe Namath (Lordy, he was hot – or ‘a fox’ in the parlance of the day) and TV’s hottest actress, Farrah Fawcett (she of Charlie’s Angels) ensured a wider, less discerning, audience. As she slathered his handsomely dimpled face with Noxzema (link to the commercial) shaving foam, a TV phenomenon was born. From then the ads became longer, pricier and more extravagant, attracting viewers who wouldn’t normally be interested in football (ie, many women). In the 1980s the Super Bowl morphed from a quite watchable sporting event to the all-singing and all-dancing pop culture extravaganza that it is today. From Diana Ross’s mesmerising appearance at Super Bowl XVI, through to Cher, The Rolling Stones and the ‘shocking’ Nipplegate of 2004 when Justin Timberlake ‘accidentally’ revealed Janet Jackson’s breast, Super Bowl entertainment yearly outdoes itself. I wonder what this year has in store? I shan’t know until the next day as the bloomin’ thing doesn’t kick off for us in the UK until 11.30 pm. As for the food, come Sunday dips of all description will be scooped up by the contents of enormous toddler-sized bags of chips (crisps); various and sundry meats will be spiced, slow-cooked and pulled for the now ubiquitious (and delicious) sliders; and platters of sugary confections will prompt a run on antacids the following day. I am sure there will be plenty of more wholesome fare (I have seen the evidence on Pinterest), but it is a party, after all. And at nearly all parties and gatherings for this winter sports event will be a pot of chilli. I can’t think of anyone who doesn’t like a good bowl of chili. Leaving aside those who regard beans in chili as an abomination (aka Texans), red bean chilis were popular when I was growing up. Usually with a token can of Bush’s, most chilis in 1970s America contained primarily ground beef – the carne of chilli con carne. Manly food for manly sporting events. I may be exaggerating a bit but mostly people ate their chili from a can. Not literally of course (usually), but in the1970s we were really digging canned foods, and ‘tv dinners’. Vegetarian chili – homemade chili – was the preserve of people who made their own yogurt, and distrusted shampoo. My mother must have been a closet hippie (although she smelled lovely and we bought our yogurt) because our chili always had way more beans than meat. Eventually, and without any protest from the family, the meat was ditched in favour of all-bean. This was in the 1980s. The only time I think I have ever been ahead of a curve. And it wasn’t me out in front, it was my mother. I was just along for the culinary ride. Flash forward to 2014 and there seem to be as many permutations of chili as there are recipes for brownies. In other words, loads. And many seem to be chocka with black beans. For good reason: black beans rule. Even men who might balk at the idea of eating something deliberately vegetarian – or God forbid, vegan – are very pleased to dip their cornbread into a steaming bowl of black bean chili. And that isn’t a euphemism. Really. For quite awhile I have been making my Very Veggie Black Bean Chili, and scarfing it down with skillet-baked cornbread (also in that link). Lately, however, I have been experimenting, wanting something thicker, heartier and suitable for when I don’t want to be faffed with making cornbread. Or rather acknowledging I am always tempted to eat the whole skillet of cornbread. Enter quinoa. Black beans and quinoa seem to be made for one another. Deceptively nutritious and filling for something so wee, quinoa is my preferred ‘grain’ for a lot of dishes. In this recipe you can use pre-cooked (bought as such, or lifted out of your freezer from a previous cooking sesh), or just add it right in from raw. But I don’t want to be too bossy so do leave out the quinoa if you fancy having this with rice, cornbread or whatever you normally have with chili. Either add cooked rice into the last bit of the cooking stage, or perhaps blend a bit more of the cooked beans to keep the comfortingly thick consistency, as written. As for its ranking on the Scoville scale, don’t worry; unlike a lot of my recipes, where I essentially do as I please, for this one I have toned down the heat to lure in children and anyone who breaks out in a sweat on sight of a chilli. This is also one of the recipes that I make for participants on my cancer nutrition course, where hot and spicy would precipitate my looking for a new job. By all means add more heat. Or perhaps do what we do at home and add a favourite smoked chillli paste. Anyone who follows me on Twitter knows I have fallen in love with Gran Luchitos smoked chilli paste in a big way (great recipes on this site, btw). Smoky, spicy chipotle in adobo sauce is an obvious – and very good – choice too. I will end this rambling post with a warning/promise to tomorrow post my simple guacamole recipe to accompany this chili, and all those chips/crisps/crudités that will be eaten on Sunday. No doubt my American readers will already have their menus sorted for Sunday, but in case not, and for all others who fancy a wholesome but really rather luxe-tasting chili, here is the recipe that has only taken a rambling 1228 words (!) to unveil. Unlike poor Janet’s breast. Poor taste joke, but good taste chili. Are you planning on watching the Super Bowl? What do you like best – the game, the food or the adverts? What will you be eating? 1. In a large saucepan sauté the onion in the oil for about five minutes, stirring occasionally, until softened. 2. Add the garlic, sweet potato, celery and red or green pepper and sauté, stirring as needed, for a further five minutes (to cook down the harder vegetables). 3. Stir in the bay/lime leaves, chili powder, oregano and cumin. Let this cook for a minute before adding two-thirds (eg two tins) of the beans, the tomatoes, tomato paste or ketchup, quinoa and three-quarters of the stock. Bring it to the boil and then turn down to simmer for 15 minutes. If you are using the cabbage/kale, add this towards the end unless you want it well-cooked. 4. While the chili is cooking, blend the remaining cooked beans to a puree with a hand blender, or similar. Add into the chili and carry on simmering for a further five minutes. If you want it a bit thinner – more like a soup – add the rest of the stock. 5. Let the chili sit for a few minutes then taste for seasoning and heat – adjusting as you prefer. Remove the bay leaves or lime leaves before serving warm but not hot, with guacamole, Greek yogurt/soured cream, chopped cilantro/coriander and or lime wedges. This chili reheats very, very well although if allowed to sit overnight you may wish to add a dash more vegetable stock or water to make up for the absorbency of the quinoa. I really love your writing (if I was one of those people who used the word “adore” I would go so far as to say I “adore” it) You really tell a great story! I’ve shared this with my peeps! I don’t think there needs to be a Superbowl for good chili! It is not a huge deal for me now but when you live there (I did for 25 years) you can’t help but be caught up in it. You’d have to live under a rock to not have an opinion about the teams or anticipate the whole day. It is kind of an unofficial holiday, I suppose. I see…when there’s so much fanfair I can’t imagine you can escape it. They make such a huge show don’t they? It always looks amazing and so much fun, I almost with I was more into it!! 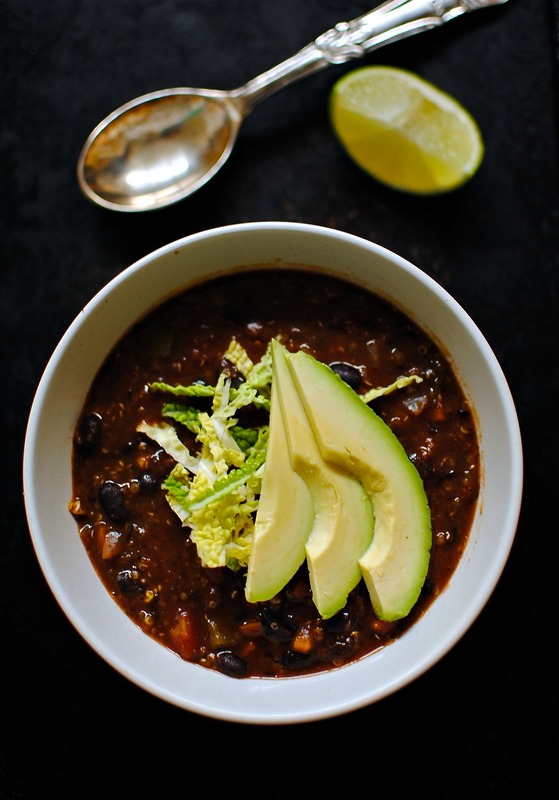 Oh my gosh, black bean chili is one of my fav comfort foods and would be my choice meal If I were to watch the Super Bowl. This looks delicious, I love your use of kaffir lime leaves, smart! And as it often happens with us ;-), I was thinking along the same lines and planning to share my version in a few weeks. Yes! You’ve just helped me decide! Chili it is on Sunday! I love this chili!!! We’re having a few people over for the game, and what I’m looking forward to the most is seeing them and all the advertisements. I was an Ad/PR major in college, so I get all excited for good commercials. I’m not making a ton of food since we’re only have a few people over, but I AM trying my hand at butterbeer from Harry Potter for the first time! It has little to do with the game and a lot to do with the fact that I finally will have enough people at my house to make a full batch! I never thought to use quinoa in chili, great recipe! 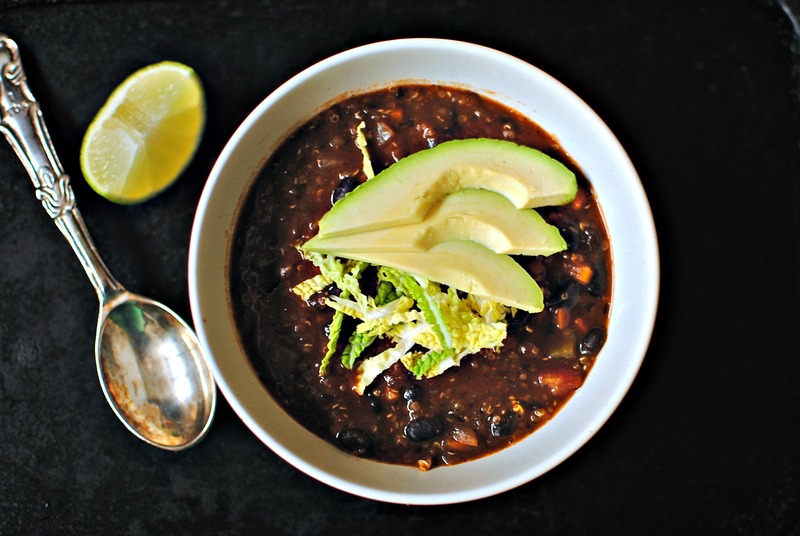 Great post, love black beans, this will be perfect for super bowl! 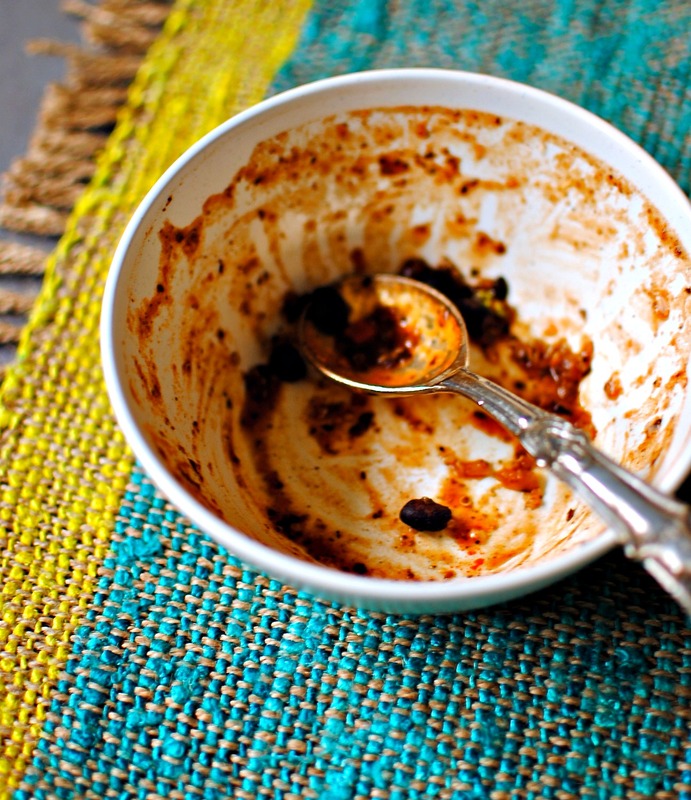 Great post, and a wonderful chili recipe!! I believe that there isn’t one carnivore who would miss the meat in this chili!! Your photos are beautiful..and I loved the history of the super bowl!! Lol.. I’m totally in it for the food, commercials, and half time! 🙂 It’s only going to be my husband, son, and daughter. We’re still discussing the menu… so far, chicken wings are the first thing on the list! Well, enjoy the big day – the food, game and the OTT commercials. Thanks so much for your sweet comment and appreciating/tolerating the marathon post! Super bowl sure sounds like a ‘big thing’ over there, Kellie. I think the most we get to see of it here are the advertisements. Great recipe, as always. This past few days I’ve been in New York and as (almost) the host city this place is at a fever pitch. Unfortunately I fly home tomorrow so will miss the game but will defiantly be trying this recipe and of course with a generous spoon of our smoked chilli paste! Thanks Kellie for such a great recipe idea! Oh Kellie, I chuckled through a few parts of your post. Trash food and cult entertainment makes me think of hairy beer bellies and the flinstones! Thank goodness your recipe looks deep, flavour packed, classy and frankly, I’d love the get spoonfuls of that on some tortilla! 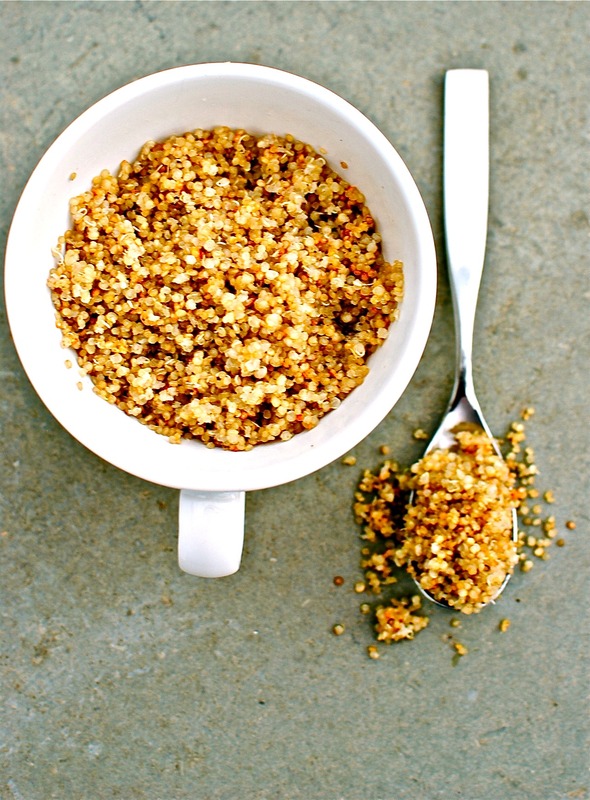 I love the sprouted quinoa idea…so clever. I wonder what it would taste like in a curry? Hmmm…. Anything can go in a curry! Well, almost… Tortillas and chili are a classic pairing. My weakness I’m afraid. Ah, thank you. I am glad you enjoyed it. Nothing to do with you starving or anything I hope! Mmmm, looking forward to trying this one. What weight dried black beans would you put to soak to get the right quantity? I’m a recent convert to pressure cooking pulses for the same reason you give, BTW. Happy Super Bowl! Hi there, I made a lot of beans and just used what I needed for the recipe. At a good guess, I would say 500g of uncooked, raw beans. That would give more than enough for this recipe. I love to make extra for dips etc. I stash extras in the freezer. Please let me know if you make this. Thanks! This is a great reminder that it’s been far too long since I made a pot of chilli! I love to make a big batch and stash single servings in the freezer, and I can’t tell you how many times it’s saved me. This version looks delish – I’m also fond of adding quinoa – and that lead photo with the avocado looks amazing. Hopefully no one became interested in watching the Super Bowl this year since it was a blow out! At least Seattle was able to put on an entertaining show! Really delicious, thank you Kellie! Filling comfort food 🙂 I made a double batch and added a bit of smoked paprika.